Retinal imaging has been described since the late 19th century and ever since there has been a steady growth in the field of imaging the fundus of the eye. It has become an essential part of ophthalmic practice and also is the standard method for documenting ocular findings. In a clinical setting this has been achieved by the fundus cameras: Mydriatic or nonmydriatic imaging systems which have helped clinicians to detect, diagnose, monitor, and share retinal images. However, these instruments are not readily available in circumstances, such as in the emergency rooms, intensive care units, or when the patient is immobile as most of these systems are bulky and stationary and hence the availability and high cost limit their routine use in ophthalmology. Portable cameras introduced for fundus imaging are often costly and must be connected to computers for processing and visualization and also for storage. The ubiquitous smartphones have become an inexpensive alternative for fundus imaging when coupled with a condensing 20D lens. Smartphones equipped with high-resolution cameras are being used to take the anterior segment and fundus pictures.,,, Smartphones have the potential to capture high-quality fundus photos as it incorporates an optical and illumination system in the form of a condensing lens and a source of light such as the light emitting diode (LED) flash which is coaxial. When this optical system is then coupled with the 20D condensing lens it resembles an indirect ophthalmoscopy optical system which allows us to record digital fundus images. To increase the ease and stability of taking a fundus photograph, we need to keep the smartphone and the condensing lens in alignment with a structural device. This structural support can be given by modifying the readily available used materials from the clinic which would otherwise be thrown into the waste bin. Here, we describe the method to create such a device within a few minutes and how to use it efficiently [Table 1] and [Figure 1]. A used hand sanitizer bottle of 15–20 cm was taken. The 20 D lens was kept at the base of the bottle and an outer circular outline was marked. An inner circular outline was drawn such that it was 0.6 cm less than the diameter of the outer outline. The circles drawn were then divided into four quadrants (a, b, c, d). The outer circular outline area of panels a and c and the inner circular outline area of panels b and d was cut continuously which gave rise to flap like structures at area b and d. The flaps were folded inwards and the 20D lens was inserted into the circular hole made at the base of the bottle in a rotational manner. 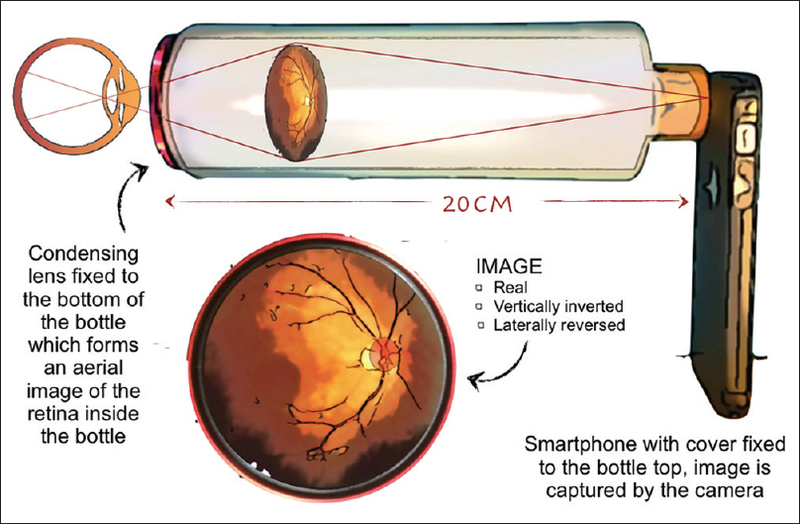 The next step was to attach the smartphone to the top of the bottle and align it. For this, an old phone case was taken with the smartphone in it and was aligned in a way that the 20D lens borders fit exactly into the screen of the smartphone in the camera mode. Once it was aligned the case was adhered on the bottle top using an instant adhesive such as superglue (cyanoacrylate)/Fevi kwik (Pidilite). The smartphone can also be alternatively placed on the bottle top using any of the several universal smartphone adapters in the market making the T3 Retcam universal to any smartphone. A black roll of sandpaper/matt black chart paper was measured and fit exactly inside the bottle with the rough side facing in. This reduced the artifacts and reflection of light from the internal surface of the bottle. The device was aligned in position to take anterior segment and fundus images. It hardly took a few minutes to make this device, with materials available in the clinic in a very inexpensive way [Figure 2]. This procedure was performed on dilated eyes. The flashlight used in the smartphone was strong enough to obtain clear fundus images. It is advisable to practice the procedure on model eyes or on peers before attempting on any patient as it has a small learning curve. Patient cooperation is a must to get good fundus photographs [Figure 2]. The patient was explained about the procedure and that it involves shining bright light for a minute or two into the eye. The pupil was dilated using 1% tropicamide with 2.5% phenylephrine, one drop each 2–3 minutes apart for 15–20 minutes until it became dilated. The retinal photographs can be taken in both siting and lying down positions. The patient was asked to look at a target finger with the other eye. The smartphone was set on video mode with the flash kept on in the continuous mode. The 20D lens in fit exactly to the smartphone screen using the zoom option. The room was darkened and the T3 Retcam was placed 3–5 cm away from the dilated eye. The device was supported with the index finger, whereas the middle and the ring finger were used to keep the patient's eye open. The device was aimed at the pupil to find out the retinal glow and the retinal image was recorded in the smartphone. While recording, the device was moved to focus and get an image free of artifacts. The device was aligned in different angles to take peripheral photographs. The device can also be coupled with scleral indentation though practice is required. Once a satisfactory image was achieved, the patient was asked to lie back and relax. The image recorded was laterally reversed and vertically inverted hence any movement while attempting to align was noticed to be in the opposite direction of the image and could be addressed by recording it with the smartphone placed upside down. There are also innumerable applications such as the HopeScope and Ullmann Indirect, in play store and app store for Android and iOS respectively which help in editing these photos and also allows to adjust the flashlight intensity, focus, exposure, helps invert the images, and also stores name and diagnosis for future reference and follow-up [Figure 3]. The usage of small portable and optimally attachable lens to obtain a high definition image of the anterior segment have been tried. The same principle can be used with The T3 Retcam. The device was held in front of the eye around 5–10 cm with the flash on or with an external light from a torch/slit lamp to obtain photograph or video in good quality [Figure 4]. The optics of the T3 Retcam is similar to the optics of an indirect ophthalmoscope, the difference is that we do not use an indirect ophthalmoscope head mount but a smartphone instead. The beam of light arising from the smartphone flashlight that is fixed at the top end of the T3 Retcam is directed toward the patient's retina and the reflected light rays from the retina passes through a condensing lens that is fit at the other end and forms an aerial image which is real, inverted and located approximately 2–4 cm from the lens (depends on the condensing lens used) inside the Retcam. This image is then recorded by the smartphone camera (replaces the observer's eye in indirect ophthalmoscope). Every smartphone camera has a lens and a sensor. The camera's convex lens focuses incoming light from the aerial image onto the sensor. The sensor chip features an array of minute light capturing cells that pick up the photons at their various wavelengths as focused by the lens, translating them into electrons. The sensor is surrounded by transistors which then amplify the charge of the electrons gathered by the cells and sends it to a converter which further translates the differing charges of individual cells into pixels of various color and finally a digital photograph [Figure 5]. Quality of the fundus photographs is comparable to that of the fundus cameras and are proved by studies where masked reviewers did not find a significant difference., Quality of fundus images was higher when taken by a more experienced examiner than a junior examiner. There is a learning curve, like other examination techniques mastering this need practice. The field of view depends on the condensing lens used (dioptric strength). Lower the lens power higher the magnification and smaller the field of view. Flashlight intensity cannot be adjusted in most smartphones; hence, one can dim the light using an adhesive tape to reduce the intensity. There are many apps which help adjust the intensity of the flashlight, exposure, focus, and also the orientation of the retina image. Smartphone fundus photography is a safe technique. Kim et al. in his study mentioned that the flashlight of the iPhone 4 camera is 10 times less luminous than a conventional indirect ophthalmoscope light. On one hand, it offers comfort to the patient but on the other limits image clarity in media with opacification. The same study reports that smartphone light source is well below the limits set by the International Organization for Standardization (ISO 15004-2.2) for ocular thermal hazard and photochemical hazard. The coaxiality of the flashlight and the camera is important as those smartphones with a distance more than 1 cm between camera lens and flashlight would require a longer tube. The T3 Retcam is also an attempt to utilize the used materials in the clinics/hospitals which otherwise would have been dumped into the trash; hence, a novel way of recycling these plastic bottles and a small attempt to reduce environmental pollution. The use of this device in teleophthalmology further goes a long way in reducing the carbon footprint in the medical and the healthcare field. Smartphones are beginning to play a major role as a medical diagnostic tool,,, Taking into consideration of the simplicity, stability, and affordability of the device; nevertheless, the portability, data storage capacity, and wireless connectivity of the smartphone make the T3 Retcam an important tool for diagnosis and documentation in various setups, such as clinics, hospitals, health centers, and camps. Department of Ophthalmology, Sri Manakula Vinayagar Medical College and Hospital, Puducherry. Bernardes R, Serranho P, Lobo C. Digital ocular fundus imaging: A review. Ophthalmologica 2011;226:161-81. 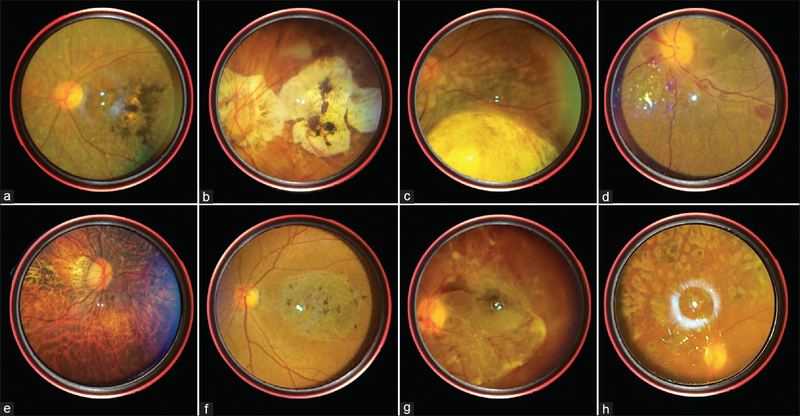 Bennett T, Barry C. Ophthalmic imaging today: An ophthalmic photographer's viewpoint-a review. Clin Exp Ophthalmol 2009;37:2-13. Lord R, Shah V, San Filippo A, Krishna R. Novel uses of smartphones in ophthalmology. Ophthalmology 2010;117:1274-1274.e3. Shah V, Chhablani J, Kaja S. Smartphones in ophthalmology. Indian J Ophthalmol 2012;60:127. 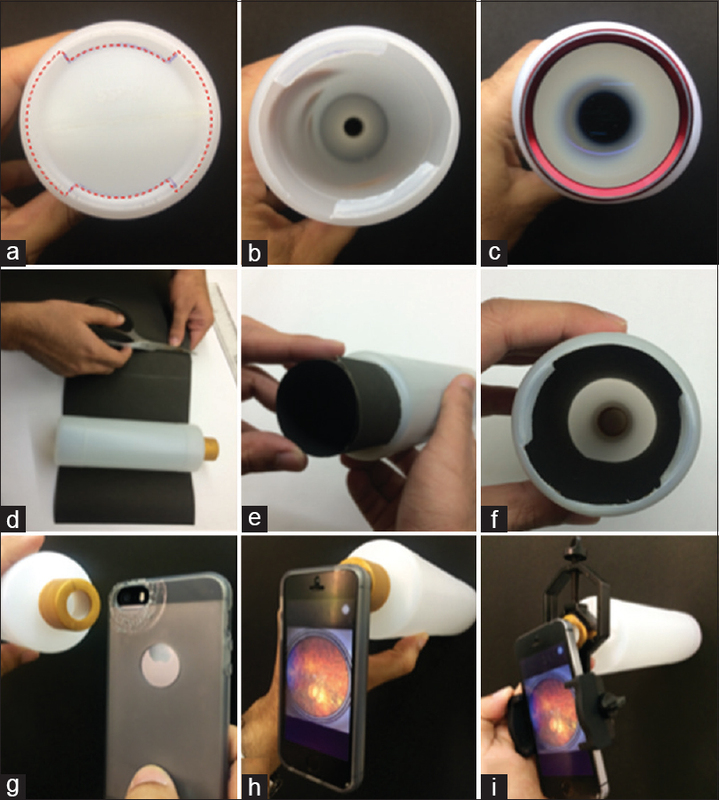 Shanmugam M, Mishra D, Madhukumar R, Ramanjulu R, Reddy S, Rodrigues G. Fundus imaging with a mobile phone: A review of techniques. Indian J Ophthalmol 2014;62:960. Haddock L, Kim D, Mukai S. Simple, inexpensive technique for high-quality smartphone fundus photography in human and animal eyes. J Ophthalmol 2013;2013:1-5. Bastawrous A. Smartphone Fundoscopy. Ophthalmology 2012;119:432-3.e2. Bolster N, Giardini M, Bastawrous A. The diabetic retinopathy screening workflow. J Diab Sci Technol 2015;10:318-24. Akkara J, Kuriakose A. Innovative smartphone apps for ophthalmologists. Kerala J Ophthalmol 2018;30:138. Pujari A, Mukhija R, Singh A, Chawla R, Sharma N, Kumar A. Smartphone-based high definition anterior segment photography. Indian J Ophthalmol 2018;66:1375. Snead M, Rubinstein M, Jacobs P. The optics of fundus examination. Surv Ophthalmol 1992;36:439-45. Adam M, Brady C, Flowers A, Juhn A, Hsu J, Garg S, et al. 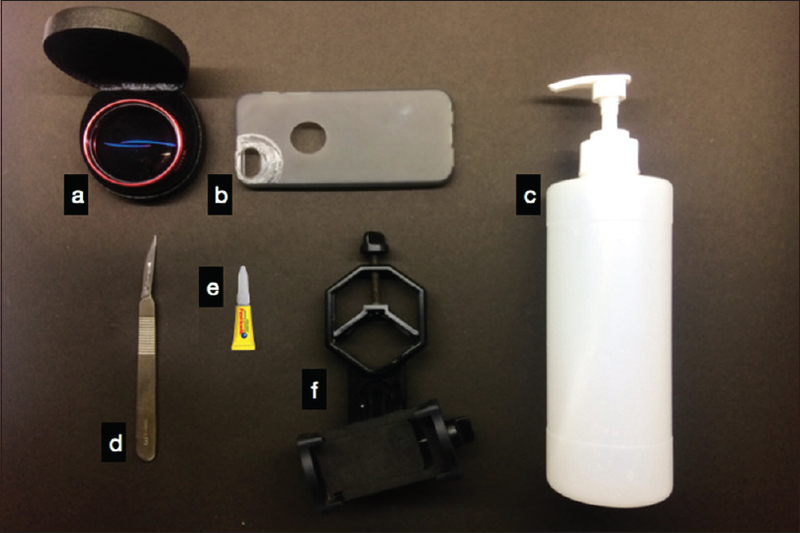 Quality and diagnostic utility of mydriatic smartphone photography: The smartphone ophthalmoscopy reliability trial. Ophthalmic Surg Lasers Imaging Retina 2015;46:631-7. Russo A, Morescalchi F, Costagliola C, Delcassi L, Semeraro F. Comparison of smartphone ophthalmoscopy with slit-lamp biomicroscopy for grading diabetic retinopathy. Am J Ophthalmol 2015;159:360-4.e1. Kim D, Delori F, Mukai S. Smartphone photography safety. Ophthalmology 2012;119:2200-1. Venkatesh R, van Landingham S, Khodifad A, Haripriya A, Thiel C, Ramulu P, et al. Carbon footprint and cost–effectiveness of cataract surgery. Curr Opin Ophthalmol 2016;27:82-8. Maamari R, Keenan J, Fletcher D, Margolis T. A mobile phone-based retinal camera for portable wide field imaging. Br J Ophthalmol 2013;98:438-41. Raju B, Raju N. Regarding fundus imaging with a mobile phone: A review of techniques. Indian J Ophthalmol 2015;63:170. Nazari Khanamiri H, Nakatsuka A, El-Annan J. Smartphone fundus photography. J Vis Exp 2017. doi: 10.3791/55958. Raju B, Raju N, Akkara J, Pathengay A. Do it yourself smartphone fundus camera – DIYretCAM. Indian J Ophthalmol 2016;64:663.